^ 3.0 3.1 Premature emergences, or "straggling" occurred in 2003 and 2006. ^ This 13-year brood does not include M. neotredecim. ^ Maxine Shoemaker Heath. Genera of American cicadas north of Mexico (Ph.D.论文). University of Florida. 1978. doi:10.5962/bhl.title.42291. ^ Lloyd, M., and H.S. Dybas. The periodical cicada problem. I. Population ecology. Evolution. 1966, 20 (2): 133–149. JSTOR 2406568. doi:10.2307/2406568. ^ Williams, K.S., and C. Simon. 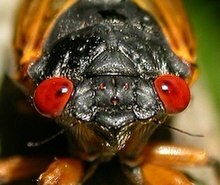 The ecology, behavior, and evolution of periodical cicadas (PDF). Annual Review of Entomology. 1995, 40: 269–295. doi:10.1146/annurev.en.40.010195.001413. ^ Alexander, Richard D; Thomas E. Moore. The Evolutionary Relationships of 17-Year and 13-Year Cicadas, and Three New Species (Homoptera, Cicadidae, Magicicada) (PDF). U Michigan Museum of Zoology. 1962 [9 June 2011]. ^ Capinera, John L. Encyclopedia of Entomology. Springer. 2008: 2785–2794. ISBN 1-4020-6242-7. ^ Marlatt, C. L. The Periodical Cicada. USDA. 1907: 28. ^ Post, Susan L. A Trill of a Lifetime. The Illinois Steward. 2004 [9 June 2011]. （原始内容存档于2007年5月10日）. 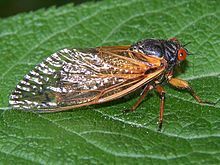 ^ Swarms of cicadas emerging in Midwest. Associated Press. 20 May 2007. ^ Brood XXII (13-year) The Baton Rouge Brood. National Geographic Society. [28 August 2011].